Here's another Black Mask comic book review for you. This one written by Ryan K Lindsay, his first title with the label. 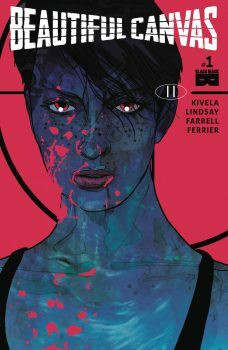 I have read everything Lindsay has published with a favorite being Negative Space published by Dark Horse in 2016. The first issue of Beautiful Canvas is currently available at a comic shop near you. You can grab your copy of issue #2 on July 26th. The story largely centers around hit woman Lon who's complicated life is further complicating her relationship with her girlfriend Asia. The story is told through different Lon's eyes, memories and sets of Lon's victims and pursuers both living and dead. However something truly odd is thrown into this crime story, mutants... superhuman mutants to be exact. It's at this point that this reviewer cannot tell if all this is taken as reality or if Lon is losing her marbles. I'm taking it on faith that this story portrays a reality of super humans and humanoids. The story is nowhere near linear so you are really going to have to be paying attention. This isn't a passive read although every segway is separated by a new titles and character introduction in the form of retro movie commercial announcement : "So and So stars in Something Vague but Witty". There's a lot of eerie imagery throughout the story. One moment your witnessing a heartfelt embrace between two lovers and then lurking in the background you see this bloody, ghostly figure... and as a side note, there's nothing more unnerving than ghost children! The story is illustrated with a pop art style which can be more-so attributed to the color pallet rather than the actual line work. Beautiful and bright yellows, fuchsia's, purples and blues come together to draw the eye to each panel. If you are ready for something out of the ordinary then I highly suggest checking out Beautiful Canvas.